and each side has 3 bedrooms with attached en suite bathrooms. In addition, each home has its own den, kitchen, dining room and half bath, with all rooms fully air conditioned. The pricing is for the whole property, all 6 bedrooms. The house is detailed with the finest quality materials. The floors and showers throughout the home are conchuela, a stone made from conch shells that is always cool to the feet. The countertops are a beautiful granite. Several furniture pieces are hand crafted by a local artist on Isla. Every bedroom has an all cotton plush king mattress. Four of the bedrooms have twin pullout mattresses under the kings. The homes are furnished with high quality linens as wll as safes for your convenience. 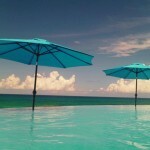 Casa Gemelos has the largest private pool on the island, with a 46 foot infinity edge facing the Caribbean Sea. The home also has a massive 60′ covered terrace on the main level and the two upstairs master suites have a palapa covered wrap around balcony. 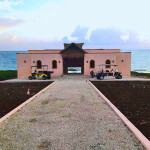 This property is ideal for couples traveling together, for family reunions, wedding venue or for corporate retreats. 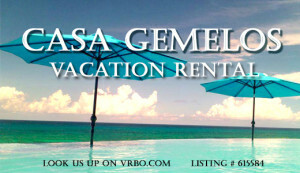 Our professional staff will provide daily maid and pool service. 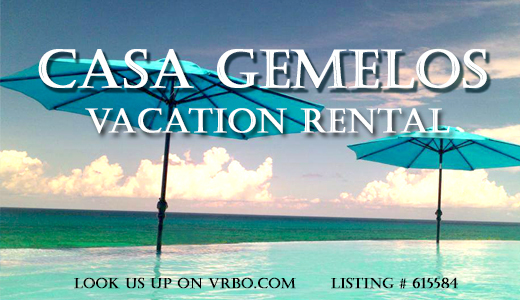 Please note that Casa Gemelos is under construction and will be available for your dream vacation starting October 1, 2014. So get ready to watch for dolphins while enjoying the vast outdoor space. Delight in the stunning sunrise and enjoy the cool trade wind breezes that make this Caribbean side of the island so popular.